Proprietary Name: Leader Castor Oil What is the Proprietary Name? 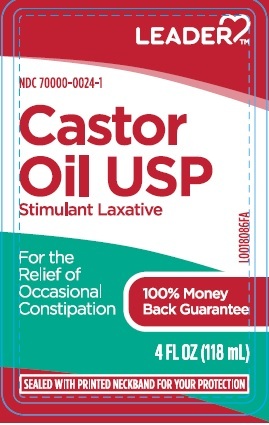 Non-Proprietary Name: Castor Oil What is the Non-Proprietary Name? Leader Castor Oil with NDC 70000-0024 is a a human over the counter drug product labeled by Cardinal Health. The generic name of Leader Castor Oil is castor oil. The product's dosage form is oil and is administered via oral form. FDA Application Number: part334 What is the FDA Application Number? For relief of occasional constipation (irregularity). Generally produces bowel movement in 6 to 12 hours. Taking any other drug. Take this product 2 or more hours before or after other drugs. Laxatives may affect how other drugs work. If you have rectal bleeding or failure to have a bowel movement after use. These could be signs of a serious condition. Keep tightly closed, away from excessive heat.